Medium - $94.99 Only 3 left! Large - $107.99 Only 1 left! Of course, that isn’t so hard to answer, is it? Presley had a style so much his own and so memorable that we can find contests all about who can most closely impersonate the musical and film giant. There’s even categories. Look-alikes and Sound-alikes, Young Presleys, Jailhouse Rock Presleys, Too Many Peanut-Butter-and-Banana Sandwiches Presleys… Perhaps the King isn’t truly dead so long as we continue to honor his memory with some fantastic impersonations while wearing some of his most famous costumes. 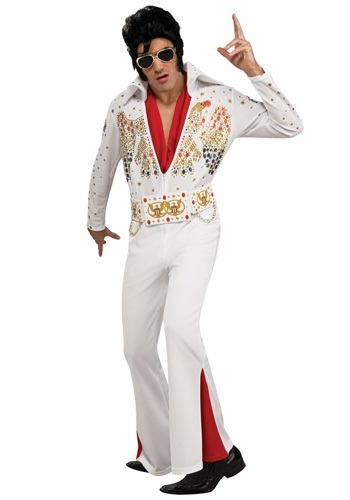 And it is your turn, too, to awaken the King with this officially licensed Deluxe Adult Elvis costume. The white jumpsuit features the golden luster of stars and rhinestones and has a split along the legs to reveal the beautifully contrasting red at your ankles. Golden eagles and rhinestones decorate the white foam belt which features golden chains hanging down in wealthy accent. Couple this look with any of our Rock Legend wigs and you will be slicked back and ready to rock. Your fans won’t be able to help falling in love even long after you have left the building.